I felt it important to listen to this album because of 'some velvet phasing'.i love this effect and had previously thought that Jarre had done it first.apparently not.though to be fair JMJ used it to greater effect in my view.nonethless, Klaus did it first. From what Ive read most people write this off as boring, monotone and downright dark. While I think its progressively better that his first two drone like and experimental albums it was still relatively a new release in this soon to be pioneer of Germanic electronic space musicians catalog. What the "open" ended ear received is three long hypnotic compositions ranging from slightly psychedelic i.e. Ways of Change with its conga and 12 string acoustic arpeggios combined with phased organ and analog synthesizer accompaniment. By the last track Voice of Syn you are shellacked with a male vocalist singing in what I imagine is German against heavily phased sweeping Farfisa organ and synthesized percussion. The music IS minimalist and intentionally isnt based around three chord American blues rock music nor is it classical tho one can hear some Bach-esque organ like meanderings. Schulze was expressing the freedom not to conform to a particular style or the pressure to hook you the listener in with a hook and bait melody. Instead he chooses to use his primitive electronic instruments to create tone paintings with long broad strokes and darker hues like a long winter in the hinterlands. As a genuine artist he follows his own path and for that you cannot fault him. BD was never a release I felt a strong point in his catalog especially having been introduced to his music via Timewind however I enjoy its genuine departure from making music to conform to any popular trend, style or sound.That in my book is why I enjoy all his earlier music! My copy is like this but has Mould SID Code: IFPI 0783. Fairly boring piece imho where it sounds like he is only hitting the black note keys on his keyboard and here and there manages to play out of tune even. As another reviewer put it the poor relation to Timewind. I first heard this album in 1994 or so, and it's one of about a half-dozen Klaus Schulze records I've been exposed to. Qualitatively, it ranks somewhere in the middle. However, it's a bit different from his other work, being a little colder and harsher with its rhythmic bits. At the time, I felt that were it to be reissued on the Rephlex label with no artwork or details on the packaging, it'd be hailed as some new secret dark ambient / hard techno DJ-tool project of that label's luminaries. 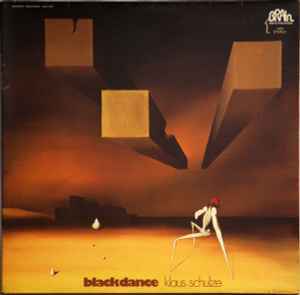 Filed under just "electronic"/"experimental", though, with Klaus Schulze's name and dated psychedelic artwork on it, it was bound to languish in the bins, unknown to all but the most adventurous of young DJs. Nowadays, 15 years on, I never listen to it, but I still remember it fondly as being part of an intense period of zoning out to cold, deep drones and aggressive, industrial-ish machine music. Twenty years passed between my last listen to this album on vinyl and the reissue here; I always regarded this album as the 'poor relation' to Timewind, and found the strange raspberry headed figure in the artwork strangely unsettling.